We’re far enough into 2019 that you can say you’re either continuing strong with your new year’s resolutions, or that you haven’t thought about it since January 2. Does that mean you give up and try again in 2020? Well, if that’s the way you want to take it, you may as well stop now. Although I highly recommend you keep reading and let me change your mind. Just because you fell off the bandwagon for your new year’s resolutions, that doesn’t mean you can’t restart, or start brand-new. Pretty sure I’ve redone my new year’s resolution about five times a week, so you’re good. You just have to keep trucking along and give it another shot, but actually mean it this time. Let’s make 2019 all about improving your quality of life and being happy with who you are. Okay, so you may think this is one of those cheesy articles that tell you to look yourself in the mirror to get yourself pumped up every morning, or to smile at everyone you walk by (although they aren’t terrible ideas, to be honest). Instead, I’m going to talk to you about other habits that you may not have thought to focus on. Now, it’s true that we need habits that boost our confidence, improve our mental health (now more than ever), and help to ease our stresses throughout the day. However, some of those habits come in different shapes, sizes, and ways we would never have recognized. Enough of the chit chat and let’s get down to business. I have some habits you may want to consider testing out. What’s a typical new year’s resolution or habit people want to get into? Making more money, managing their money, saving their money, just MONEY in general! I don’t blame them. Money is one of the top stressors in life. It can cause tension in relationships, affect your job, and bring down your overall mental health. How do you get rid of the stress of money? In more than one way, but learning to manage it is a good start. How many times have you read an article that tells you to budget, watch your spending habits, and to track your income and expenses? Well, it’s because they all have a point. How can you keep tabs on where your money is going if you don’t pay attention to it? And don’t think you can rely on memory alone. I’m a huge fan of physically seeing where I spend my money and by how much. One way of doing that is by setting up an account with something like Personal Capital. You can safely link all of your accounts into one program that will help you keep track of your financial life. The point behind it is to give you a snapshot of what you’re doing with your money and to help you save. Retirement, a house, school, or even a pair of shoes you’ve been eyeing up, it doesn’t matter what it’s for. When you know where your money is going, you’ll know where you may need to slow down and adjust your savings plan. It’s one thing to say you’re going to learn how to manage your money, but if you don’t actually take control of your financial life, there’s only so much you can do. So, how can you take control? Besides using programs like what’s listed above, to help you track everything, you can find ways to bring in more money. Now, don’t think you need some crazy job on top of what you’re already doing. We don’t need to make 2019 the year you burn yourself out (trust me, been there done that). You can earn and save money quite simply actually. For example, you have Ebates where you’re basically getting paid to shop from the comfort of your home. Have a bunch of gift cards to random places you’ll never use? You can sell them for cash on Raise. Answer a few questions for companies and earn money through surveys like Survey Junkie. You’re probably thinking that I’m trying to sell you on these things (maybe only a little bit). The point, though, is to show you how easy it is to bring in additional money on the side without stressing yourself out. Learning to invest has never been easier than right now. For starters, there are tons of blogs out there that are waiting to prove to you that investing can be interesting and a good thing to get into. Also, there is so much help to get your portfolio going that you barely have to do any work. You have online platforms like Ally Invest that are an excellent tool for beginners to get you going. They give you guidance, information, and help you buy stocks and set up your portfolio. They’re worth taking a look. Investing is a way to bring in a passive income. If you really enjoy it, you can pursue it even farther and turn it into a part-time job if you wanted to. Just make sure you set yourself some limits and have all the information you need. Obviously, these three habits revolve around finances. 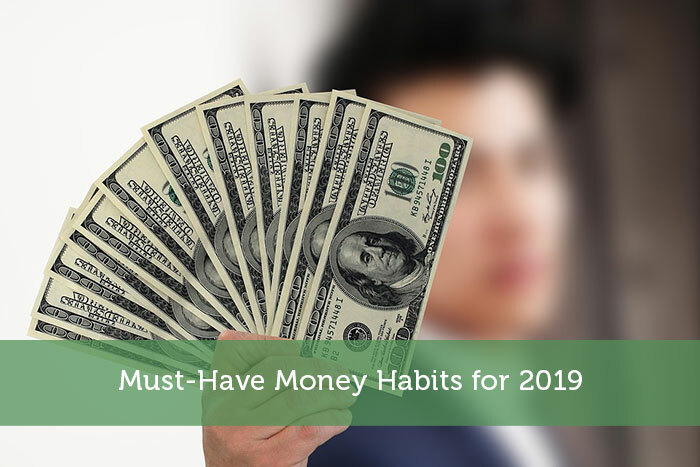 Since money is such a significant stressor in people’s lives, it made sense to focus on habits that will help ease that stress and make finances the least of your concerns. Now, don’t let money be the only focus in 2019. You still want to enjoy life, work on your mental health, and to be happy with yourself. Your finances, though, are just one of those aspects in life that once you take control over, you may find yourself being able to focus more on other parts. Let 2019 be the year you take control of your finances and your life. You’ve got this. Kailey graduated with a degree in Journalism and Religious Studies from the University of Regina, Saskatchewan. Now she lives a double life in Manitoba – writer by day and dance teacher by night. When she’s not at her computer, you’ll find her curled up with a glass of red wine and knitting, or obsessively taking photos of her puppy.